The 12th June summit between the US President and the North Korean leader in Singapore was the high point in the amazing twists and turns of risky international diplomacy, with multiple players, unfolding against the backdrop of a first class nuclear crisis in recent years. 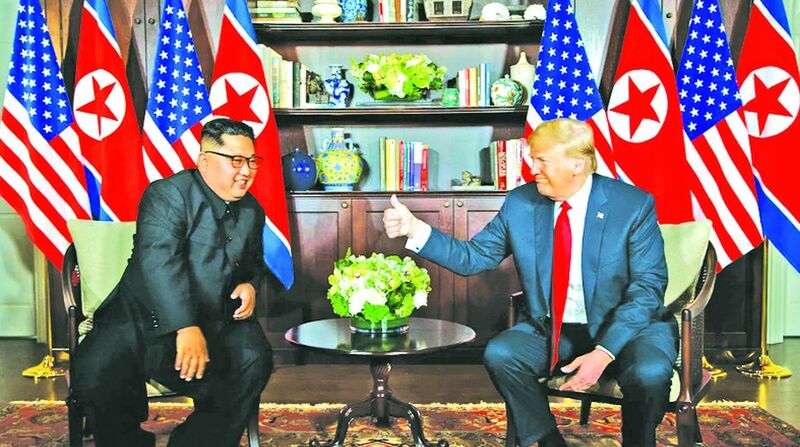 The Trump-Kim joint statement, signed at the conclusion of their talks starting with a nearly 50-minute tete-a-tete followed by delegation level talks, is short on details but provides a broad political guidance to the officials to realise the objectives of the summit meeting, namely, “new US-DPRK relations”, “lasting and stable peace regime on the Korean Peninsula”, North Korean commitment “to work towards complete denuclearisation of the Korean Peninsula”, and “recovering POW/MIA remains, including the immediate repatriation of those already identified”. In other words, the core issues in the US-North Korean bilateral relations, especially the denuclearisation of the Korean Peninsula, are to be resolved through “mutual confidence building”. Immediately after the summit, both sides began to interpret the joint statement differently. While Kim said, following the signing ceremony, that he had “decided to leave the past behind”, the official news agency KCNA stated that the two leaders had recognised the principle of “step-by-step and simultaneous action” to achieve peace and denuclearisation of the Korean Peninsula and lift economic sanctions against it as relations improve. Trump, at his press conference immediately after the summit as well as subsequently, showcased this meeting as a triumph of his personal diplomacy and his new-found personal equation with Kim, declaring that the nuclear stand-off with North Korea has been “largely solved” with the end of the risk of conflict ~ “Everybody can now feel safer than the day I took office.” Substantively, Trump declared that the verifiable denuclearisation process would start “very, very quickly” and that the US would stop US-South Korea “war games” against the North (“as long as talks take place in good faith”) which were “provocative” and a drain on US budget; for good measure, he added, that he “wants to bring our soldiers home… although this issue is not part of the equation right now”. He also added that the economic sanctions would be lifted after denuclearisation. He flagged the agreement to bring the mortal remains of the US soldiers, dead or missing, during the Korean war (1950-53) as a highly emotive issue for the US public. The other stakeholder countries started scrambling to decipher the meaning of the rather skimpy joint statement and the oral qualifications to its contents in regard to thej critical issues much talked about, before and after the summit, but missing from it. President Trump’s rhetorical style in describing his achievements and ‘disruptive’ diplomacy, leaving others second-guessing, were much in evidence at this summit as well. His announcement of suspension of “war games” caused bewilderment to President Moon, of South Korea, and confusion in the US Command there although there was official confirmation that US Defence Secretary, General Mattis, had approved it. A senior official, in the office of President Moon, stated ~ off the record, though ~ that the US military in the Republic of Korea is not subject to negotiations between the US and DPRK and that there has been no discussion about their status so far. The Chinese foreign office hoped that all parties could “grasp the moment of positive changes” on the Peninsula to take constructive steps towards a political resolution and promoting denuclearisation. The summit meeting was a culmination of several rounds of direct discussions between the US and North Korean officials. The head of the CIA has always been in touch with his North Korean counterpart and this channel has been used by the two countries, in the absence of their respective diplomatic missions, to pass on messages to each other. Before the official discussions for summit preparations were initiated, Mike Pompeo, heading the CIA earlier, had rounds of discussions with the North Koreans about the scope and the logistics for it; in fact, President Trump publicly made the then Secretary of State, Rex Tillerson, quite irrelevant before he was eased out of office. Pompeo also visited Pyongyang, first as CIA director in April and again in May as Secretary of State, for personal meetings with the North Korean leader. In addition, the details of the proposed Singapore Joint Statement were thrashed out between the two sides at the official level: these discussions will continue to realise its objectives. The upshot, after the Singapore s ummit is what the Chinese like to describe as “double freeze”: no North Korean missile and nuclear tests in return for no US-South Korea “war games”. Although the US position retains a certain ambiguity as evident in President Trump’s press conference and in the earlier instances of downscaling of these “war games” for improved atmospherics, it appears unlikely that US can use this leverage to influence the course of the forthcoming negotiations unless North Korea does something outrageous; already China and Russia support this approach. The South Korean position is supportive but cautious lest it be kept in the dark by the US during these negotiations; the South Korean President’s office has taken a nuanced position by stating only that the status of the US military in the country is not a subject for US-North Korea negotiations. In parallel negotiations between the North and South Korean militaries, South Korea is favourably considering the North Korean proposal for disarming, on a trial basis, the joint security area (the so-called Truce Village) in Panmunjom. Whilst the hard grind for the negotiators lies ahead, the North Korean leader has been able to break out of, to a considerable extent, his international isolation and, thereby, strengthen his ‘legitimacy’ with his domestic constituency and the larger North Korean public. Several critical issues, with a bearing on the regional as well as global security and stability, hang in the balance; these issues have been the subject of negotiations on several previous occasions which ended controversially, hostage to the vagaries of the US and North Korean domestic politics and the conflicting interests of the various powers involved. The scope of denuclearisation remains indeterminate, including the nature of effective monitoring of the process. Although not specifically mentioned in the Singapore Joint Statement, the Panmunjom Declaration (between the North and South Korean leaders) specifically mentions turning the current Armistice, dating back to July 1953, into a peace treaty through trilateral (involving the two Koreas and the US) or quadrilateral (involving the two Koreas, US and China) negotiations. The ambitious objective of the creation of a “lasting and stable peace regime on the Korean Peninsula” has a bearing on the larger security architecture in East Asia in which several other countries have stakes; although publicly emphasizing his objective of securing economic growth for his people, North Korean leader’s overriding concern is about regime security. A related issue is the easing of economic sanctions against North Korea, UN-imposed and US-imposed, in which North Korea has overriding interest; application of the UN sanctions can be tweaked, to suit their national interests, by the Chinese and the Russians who are permanent members of the UN Security Council. The imponderables in the Singapore-launched process are multitudinous as history reminds us. President Trump’s highly personalised diplomatic style has also spurred ‘personalised’ approaches by the other leaders. South Korean President, unhappy about the slipping in of the anti-ballistic THAD batteries near Seoul and being kept in the dark about US aggressive moves towards North Korea, reached out to China, in October last year, that South Korea will not join a regional ballistic missile defence system including US and Japan.